Description.These Shells are thin and compressed, they are in the medium. to large range for shell size. The Flag Pen shell (what this listing is offering) is considered large. It has a triangle outline, with two sides rounded. This species, as well as other Pen Shells are bivalves (mollusk that creates an upper and lower shell joined by a ligament which is as long as the toothless hinge. The color ranges from redish brown to black. 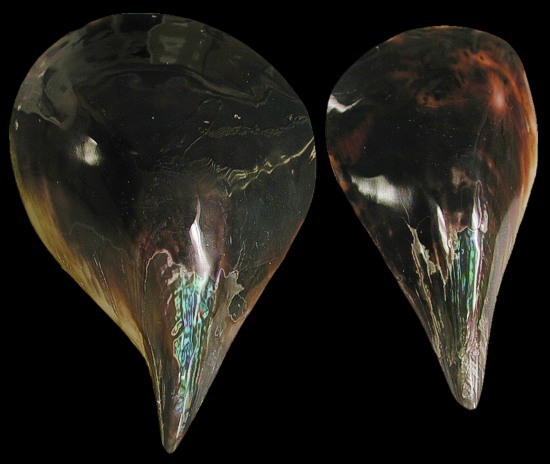 The inside lining of the shell is iridescent. It was named for the likeness of a flying flag. Habitat. Indo-Pacific region. This ranges from the Indian Ocean, east to the northern Australian/New Zealand shores. It prefers offshore and a sandy sea floor. This shell is not considered rare.